Heat oven to 325° F. Spray bottom and sides of 13 x 9-inch pan with cooking spray. In large bowl, mix Crust ingredients with spoon until soft dough forms. Press dough in bottom of pan. Bake 15 minutes. Remove from oven to cooling rack; cool 10 minutes. In medium bowl, beat cream cheese and brown sugar with electric mixer on medium speed until smooth, scraping down side of bowl frequently. Beat in 1/4 cup chocolate fudge sauce. Add eggs, 1 at a time, beating until just blended. Stir in cream and vanilla. Spread filling evenly over cooled crust. 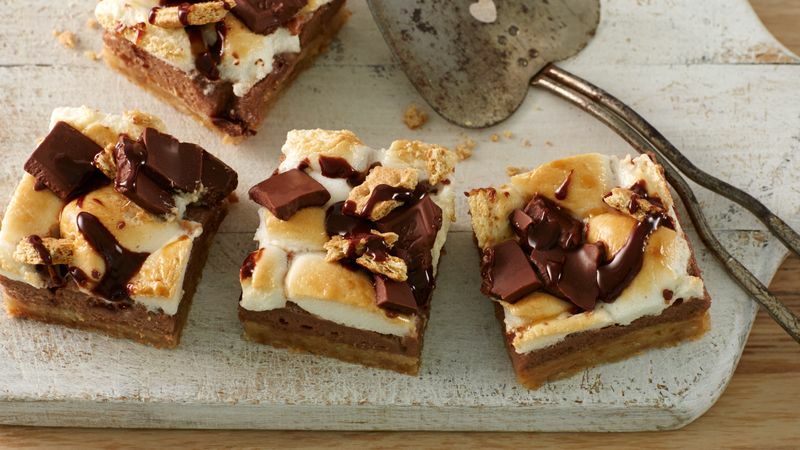 Place cut marshmallows in single layer, cut sides down, on top of filling. Bake 35 to 40 minutes or until marshmallows are light golden brown. Remove from oven; scatter chocolate bar pieces on top. Bake 2 minutes longer. Cool 30 minutes on cooling rack. Refrigerate about 2 hours or until cooled completely. Before serving, in small microwavable bowl, microwave 1/4 cup chocolate fudge sauce uncovered on High in 15-second increments until thin enough to drizzle. Top cheesecake with graham crackers pieces and drizzled chocolate. Cut in 6 rows by 4 rows. When cutting marshmallows in half, first spray scissors with cooking spray so there’s less sticking.